What a Great Opportunity to Tell who the Keeper of the Family Diary is! Is there something missing from your scrapbooks? Are you in there? 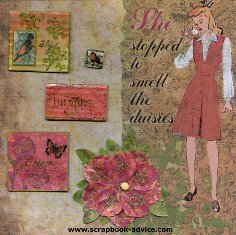 Suggestions from the Book of Me Scrapbook Layouts Challenge can cure those missing pages. As the family historian and quite often the photographer as well, do you forget about putting something about you in your pages? Who is this person that has become the keeper of the family diary? Don't forget as the family historian, it is important that you are in the scrapbook as well. Don't be embarrassed. Others really want to know who you are and what makes you so very special. Yes, You are Very Special! And don't forget! These layout suggestions on the following 12 pages can also be used for scrapbooking and journaling ideas for all your pages. 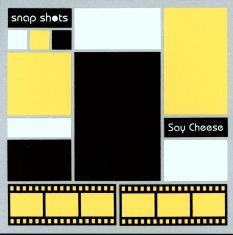 What a great way to start your Book of Me Scrapbook Layouts with this page kit, and the journaling die cuts that say "Camera Shy", "Snap Shots" and "Say Cheese." And just like you are curious and would like to know one more little thing about who is in that old photo, or how did that photo come to be taken, or how did those two people called my grandparents meet; you need to supply some of that information to those who will one day want to know more about you - therefore we all need some page layouts from the Book of Me. This layout is the front inside cover of my Book of Me Scrapbook. "She Stopped to Smell the Daisies!" This layout, while it does not have my name on it, reminds me of a change that has taken place in me since I have become a photographer and scrapbooker. I see more things that are Photos Ops and more things in everyday life that are important, that I need to take note of and appreciate, and hope to remember. I can't hope to remember them all, but my camera can capture it and these are the moments that go into my scrapbook. This page reminds me of that. So How about an entire scrapbook about just you? Too Much? Maybe just a page or two? No need to be be embarrassed. Think about every book you have ever read. Doesn't the book jacket have a photo of the author and some biographical information about the author? That's what the Book of Me Scrapbook Layouts Challenge is all about. Whether it's just a page here and there or an entire album, you really aren't finished until you have done a page on "YOU"! We have at least 3 Book of Me Scrapbook Layout ideas or Challenges for each month of the year - that totals more than 36 separate ideas. There is a full list at the bottom of the page to quickly access each month. You might even learn some interesting things about your self when you sit down and reflect on what you like, who you are, how you came to do what you do, and maybe even where you want to go. Here again, you can just do it one page at a time - with one idea at a time. 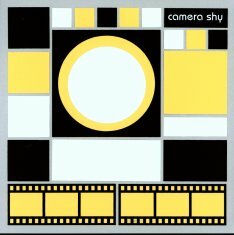 Get some Photos of You! Now! Next time you are out with family or friends, hand one of them your camera, and ask them to take your photo. Doesn't have to be anything to special - pretty flowers nearby, nice landscape, at your office, with a good friend or loved one, doing your favorite hobby. Use that photo to start with. My point is: start your Book of Me Scrapbook Layouts. I have a good friend who does that almost every time we go out. I take a couple photos of her, and she takes a few of me. I love that about her. Then, if someone is around us, often they will offer to take photos of the two of us together. You can filter these layout idea pages into your chronological scrapbook - or you can actually do an entire book-of-me. Let’s try just one page a month. Lisa arranged her challenges into monthly ones, but each monthly challenge had three options in the topic to pick from. With Lisa’s permission, I have posted her suggestions and added a few comments of my own along the way in regards to some photos you can take to help to document yourself. Do the first one, and I promise it will get easier. Shortly I hope to post a few of the results from that challenge so you can see some of the wonderful art work that was created from this collection of suggestions. So here is a list of 12 months of challenges with a total of 36 layout ideas for you to work on your "Book of Me Scrapbook Layouts" as the keeper of the family diary. I would suggest starting with the first one and then pick back up a new challenge topic every month. Pick up any month you happen to find these challenges and then start there. Go on to the next challenge each month, until you have completed an entire year. Since there are at least 3 options per month, you can keep on going with these. You just might learn a lot about yourself like I have. Book of Me - August Challenge - Me, Right Now! Book of Me - November Challenge - How Did You Get Where You Are?